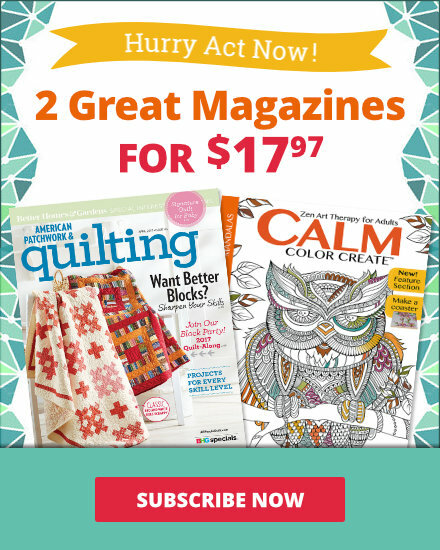 We know you love the projects printed in Quilts and More™. We took inspiration from the magazine and created web-exclusive projects. In a quest to make the easiest quilt ever, we challenged new and experienced quilters to make quilts using the same size squares. 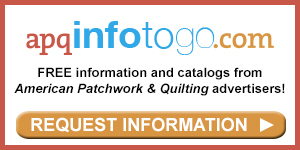 Click here to see a slide show of the Sew Easy quilts using many different fabric lines and download an alternate size chart. Using a border print makes it easy to whip up this pretty holiday project to trim your table or delight your secret pal. The pieced blocks are the only missing element in this fast-to-sew version of Good Cheer. Fussy-cut squares from Valori Wells’ Olive Rose collection for FreeSpirit are the focus, with big polka dots from Robert Kaufman Fabrics on the side. Valori’s lengthwise stripe border is mitered in the same manner as the floral border in Good Cheer. Your purse should reflect your style. Stitch and finish this one in the morning; grab it and go in the afternoon. Make this easy-to-sew bag in prints and patterns to suit your mood and style. Try your hand at unconventional fabric combos by picking a color theme, regardless of the scale of print or floral, from the same family of fabrics. Combining prints of different sizes adds zest and interest to a bag. For a twist on Penguin Patrol, change the fabrics to suit your mood. Kawaii Asian, a spunky, contemporary take on Far East-meets-Hawaii from Robert Kaufman Fabrics inspired this lively coverlet. We selected four coordinated theme prints—butterflies, stylized flowers, Asian-style lettering, and a wavy stripe print—and unified them with a single print in three complementary colorways. You’ll love this fluffy scarf so much that you’ll want to make one for each of your friends. To make this toasty version of Warm Fuzzies, we used three assorted colors of Minkee Gelato by Benartex. Make your scarf as long as you want by adding extra 3-1/2x6-1/4" rectangles to the rows. Be sure to add extra length to binding as well. For a super quick scarf, use a continuous length of fleece for the reverse side. Click here for instructions needed to make this scarf. It takes just a few fabric bits and buttons to make tiny pin pillows. 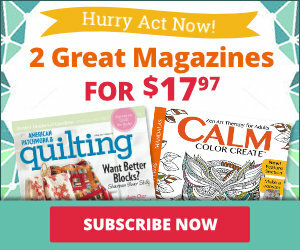 Give one away, use one to accent your sewing room, or tuck one in your on-the-go sewing kit. 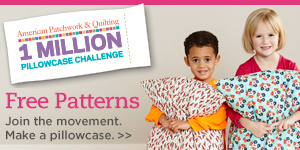 Sort through your stash for eye-popping prints to sew up a fun and playful pincushion duo. Make several from seasonal fabrics and they become perfect table favors. Add a hanging loop of perle cotton to make ornaments or package tie-ons for your quilting friends. Cut assorted fabrics for making multiples, then stitch together in assembly-line style. You’ll have a basketful of pin pillows ready for last-minute gifts. Click here for instructions needed to make this pincushion. Looks are deceiving. Though a diagonal row seems to appear, just two easy-to-sew blocks are straight-set, side by side. Using a stash of assorted florals and complementary small-scale prints, designer Anne Moscicki made Straight to the Point as fresh and lively as a country garden. 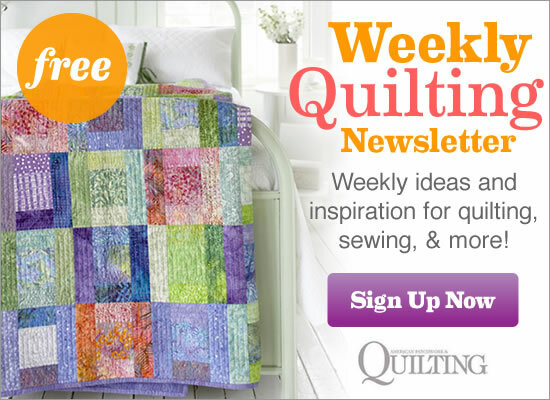 To make this stash-busting quilt, choose a favorite multicolor print and pull colors from it. Avoid the temptation to match the fabrics; just use a merry mix of colors and prints. Anne used nearly a dozen green fabrics, from pale green and chartreuse to acid green and forest. All add zest and interest. Squares of bright blue sprinkled across the quilt top add an unexpected touch of spice. Novelty fabrics star in this lively asymmetrical quilt made from easily pieced chunks of fabric. If the deep woods have special appeal, you’ll want to make Storybook Surprise in designer Amy Schimler’s fall-tone palette. We used many of the original project’s prints in different colorways, but here we added Amy’s hens and roosters print in place of the yellow print rectangle. This year, create stellar ornaments to trim the tree–or make a few for star-quality gifts. Bold and splashy contemporary fabrics sewn into funky star shapes make for merry ornaments, cherry package tie-ons, and memorable party favors. To rev lively fabric stars up a notch, embellish them with beads, ribbons, or tassels.